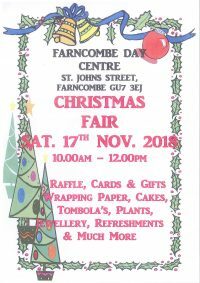 The Farncombe Day Centre will be holding its Christmas Fair on Saturday, 17 November 2018 from 10.00am to 12.00 Noon at the centre in St John’s Street, Farncombe, GU7 3EJ. There will be a raffle, cards and gifts, wrapping paper, cakes, tombolas, plants, jewellery, refreshments and much more. All welcome – we look forward to seeing you.